For many, swallowing is a reflexive action that passes unnoticed. But when this basic function doesn’t work the way it should, it can have serious consequences for a person’s health and safety. Like many medical problems, swallowing disorders can evolve gradually—and when caught early, can be treated more effectively. 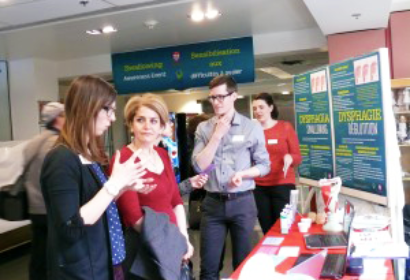 Students at the McGill School of Communication Sciences and Disorders created the first-ever Swallowing Awareness Event (SAE) in Montreal. Now held on an annual basis with Dr. Nicole Li-Jessen and Gina Mills, Interim Chief of Audiology and Speech Pathology Services at the Jewish General Hospital, the event includes activities to raise awareness of the importance of swallowing safety, free screenings for swallowing disorders, and simulations of swallowing difficulties.